A Westchester Wedding Photographer covers a plethora venues, one of the best being the American Yacht Club. The club was founded nearly 120 years ago by “robber baron” Jay Gould and a group of his friends. Over the years, the American Yacht Club has been a hub of sailing, boats, love of boats, and a place of celebration for friends and family. The location of the yacht club commands the view of what has been called “that magical point” on the Long Island Sound. The setting is full of natural beauty that creates exceptionally picturesque photos by a Westchester Wedding Photographer. This image focuses on the little details and personal touches of a wedding that add to the magic of the day. The close up is of the bride and shows the intricate details on her snow white dress. A cornflower blue ribbon is neatly tied about her waist in a bow and she wears two rings, one on each hand. On the bride’s left hand is her engagement ring. The ring is comprised of three diamonds, a big one in the center with two slightly smaller diamonds on either side of it. On her right hand is a dark blue sapphire surrounded by tiny diamonds, a second symbol of faith and devotion. This ring is a family heirloom that was given to her by her grandmother. Her grandmother was given the ring years ago by the bride’s grandfather, and it has now been passed down in love. 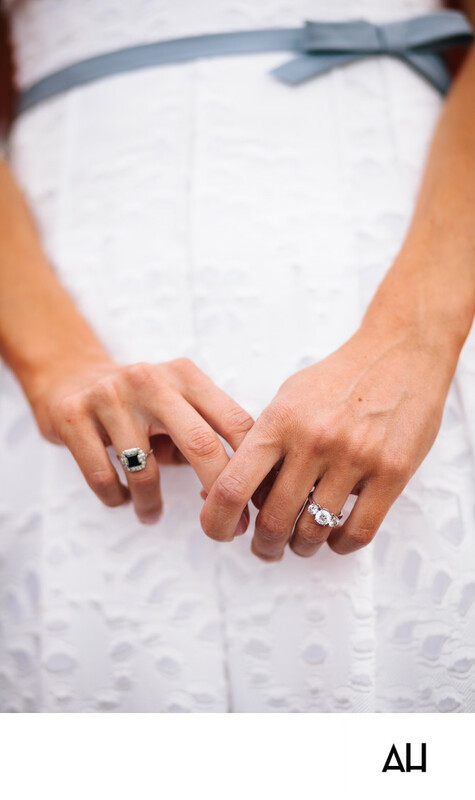 The bride wears this ring in honor of her grandparents and success that was their marriage. She knows that she has found a man to call her husband that both her grandmother and grandfather would be proud of. As a Westchester wedding photographer, there are so many great wedding venues to photograph at including Tarrytown House Estate, Crowne Plaza White Plains, Hollow Brook Golf Club, Brynwood Golf and Country Club, Castle Hotel and Spa, MountainView Manor, Tappan Hill Mansion, Trump National Golf Club Westchester, Alvin & Friends Restaurant, and Abigail Kirsch at Tappan Hill Mansion.